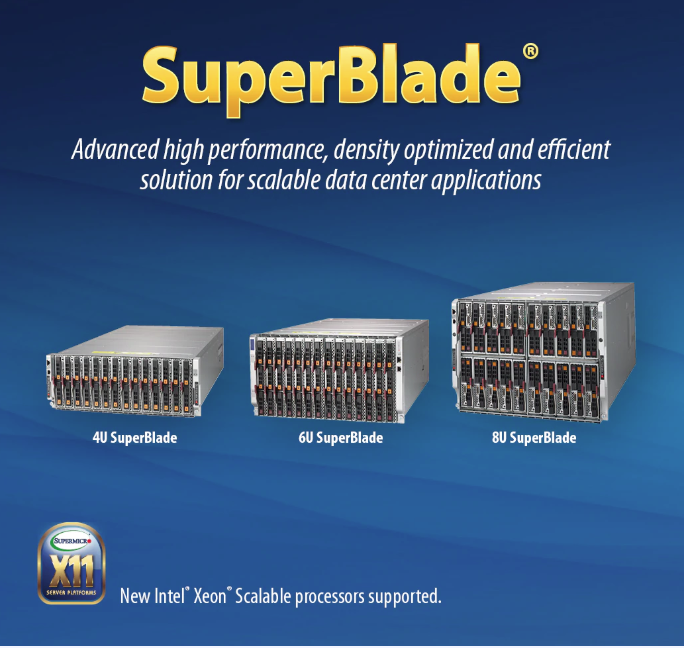 The innovative and feature-rich SuperBlade® enhances system computing density by housing multiple blade servers in a single enclosure. Applying Supermicro’s application-optimized engineering philosophy and leveraging years of rackmount server design experience, SuperBlade® modules deliver true server functionality and boast simplified access and maintenance with front-loading nodes. Each node includes up to four 28-Core Intel®Xeon® Scalable Processors with 3TB DDR4 2666MHz in 48 DIMM slots, 205W per socket, NVMe/SAS3 HDD support, optional 100G EDR InfiniBand/Intel Omni-Path or 10G mezzanine HCA, optional PCI-E 3.0 expansion card, support for up to 8 NVMe or 4 SATA3/SAS3 hard drives, and 100-240VAC redundant Titanium Level high-efficiency (96%), N+1 power supplies. Each blade server fits into existing Supermicro blade enclosures, thus protecting initial investments and offering smooth product upgrades and migrations.